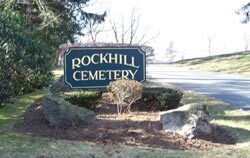 Rock Hill Cemetery, located in Foxborough Massachusetts , is a non-profit, non-denominational memorial park providing compassionate service to people of all faiths. The governing body of Rock Hill Cemetery is the Foxborough Cemetery Corporation, which was founded by a group of civic minded citizens in 1851. The Cemetery has been in operation at the present site since 1853. The original 13 acres has grown to over 52 acres, several of which are still undeveloped. The founders chose wisely when they selected this site, as the rolling terrain, the granite outcroppings, the lake and the pond all contribute to the natural beauty. Rock Hill continues to be a sanctuary offering peace and solitude to those honoring the resting places of departed family and friends. Today the trustees recognize the vision of the founders and take inspiration from it. They revere the past, but plan for the future.